Italy - 1 person likes this. 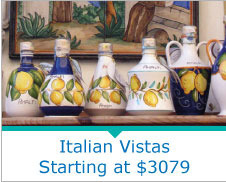 Italy will always be popular with savvy world travelers. These are just some of the highlights you may enjoy on a tour around Italy. John Geysen, a blogger for Collette Vacations, went on the Italian Vistas Tour and comprised his Top 10 Highlights. What are your favorite things to see and do in Italy? Visit the once buried city of Pompeii. Enjoy a fascinating tour into the daily life of an ancient Roman city in the shadow of Vesuvius. Dine on magical Isola dei Pescatori, accessible only by boat. Explore the Amalfi Coast, where the Mediterranean Sea and mountains meet. Sail to the enchanting Isle of Capri. Take a guided tour of Classical Rome that features the ancient Colosseum. 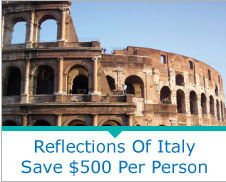 Plus, enjoy a full day at leisure in Rome to explore on your own. Explore Florence’s Academy Gallery and see Michelangelo’s monumental figure of David. 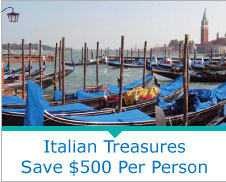 Spend two nights in the romantic city of Venice. Walk in the footsteps of great Italian Masters while exploring Florence with a local guide. Indulge in a wine tasting and regional lunch in one of Tuscany’s great wineries. Stop in the famous Swiss lakeside resort of Locarno.